Applications are being accepted for the position of Police Officer for the City of Pottsville Bureau of Police, Pottsville, PA. 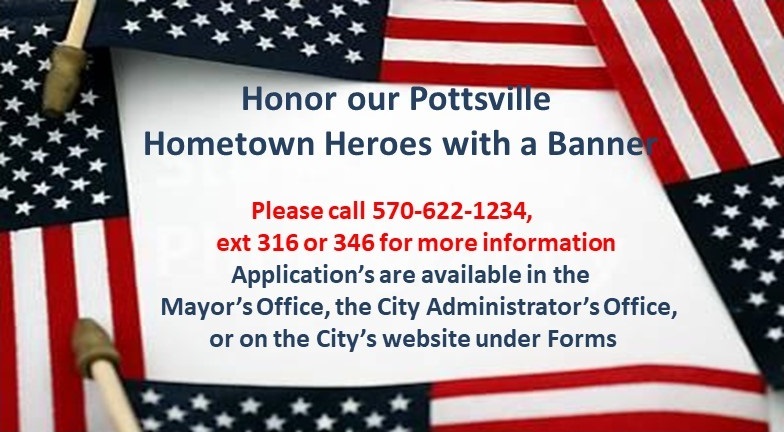 Application forms can be obtained in the Police Records office located on the first floor of Potsville City Hall, 401 N. Centre Street, Pottsville, PA, Monday through Friday, 8:00 am to 4:00 pm. 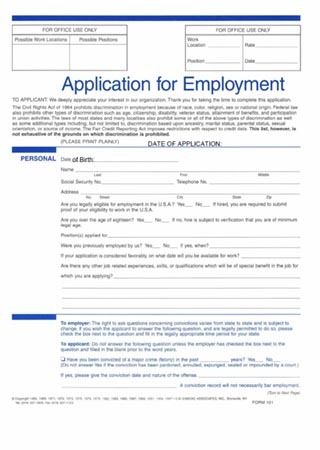 Electronic forms of the applications can be requested by sending your Name, Address, and Date of Birth via email to the police records office at hdelinko@city.pottsville.pa.us. Must have an absence of any past Felony or Misdemeanor convictions. Step 1 of the hiring process is a written examination. 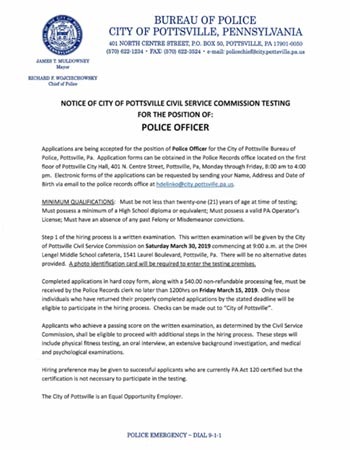 This written examination will be given by the City of Pottsville Civil Service Commission on Saturday March 30, 2019 commencing at 9:00 am at the DHH Lengel Middle School cafeteria, 1541 Laurel Boulevard, Pottsville, PA. There will be no alternative dates provided. A photo identification card will be required to enter the testing premises. Completed applications in hard copy form, along with a $40.00 non-refundable processing fee, must be received by the Police Records clerk no later than 1200hrs on Friday March 15, 2019. Only those individuals who have returned their properly completed applications by the stated deadline will be eligible to participate in the hiring process. 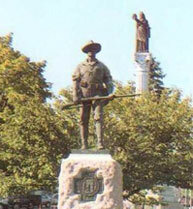 Check can be made out to "City of Pottsville". Applicants who achieve a passing score on the written examination, as determined by the Civil Service Commission, shall be eligible to proceed with additional steps in the hiring process. These steps will include physical fitness testing, an oral interview, an extensive background investigation, and medical and psychological examinations. Hiring preference may be given to successful applicants who are currently PA Act 120 certified but the certification is not necessary to participate in the testing. The City of Pottsville is an Equal Opportunity Provider. Taken from governor.pa.gov, October 24, 2018. Harrisburg, PA - Governor Tom Wolf today announced that the U.S. Small Business Administration (SBA) approved his request to declare a disaster in Schuylkill County after significant flood damage to homes and businesses was sustained due to severe storms July 21 – 27, 2018. "Record-breaking storms affected large portions of the commonwealth this summer, disrupting the lives of those unfortunate enough to live in their path,” said Governor Wolf. “Low interest loan programs like this are important financial lifelines for families embarking on the lengthy and difficult path to recovery." Homeowners, renters and businesses impacted by the storms in Schuylkill, as well as neighboring counties Berks, Carbon, Columbia, Dauphin, Lebanon, Lehigh, Luzerne, and Northumberland may be eligible for low-interest disaster loans through the SBA Disaster Loan Programs. Low-interest loans of up to $200,000 are available to homeowners to repair or replace damaged or destroyed real estate. SBA regulations permit loans up to $40,000 to repair or replace personal property. Businesses and nonprofits can borrow up to $2 million to restore damaged or destroyed buildings, inventory, equipment and assets. Loan amounts and terms are set by the SBA and are based on each applicant’s financial qualifications. Opening: Thursday, October 25: 11 a.m.
Saturday, October 27: 10 a.m. - 2 p.m. Closing: Thursday, November 1: 4 p.m.
SBA customer service representatives will be on hand at the disaster loan outreach center to issue loan applications, answer questions about the disaster loan program, explain the application process and help individuals to complete their applications. Individuals and businesses unable to visit the centers in person may obtain information and loan applications by calling the SBA’s Customer Service Center at 1-800-659-2955 (1-800-877-8339 for the hearing impaired), or by e-mailing disastercustomerservice@sba.gov. Loan applications can also be downloaded at www.sba.gov/disaster. Applicants may apply online using the Electronic Loan Application (ELA) via the SBA’s secure website at https://disasterloan.sba.gov/ela. Completed applications should be returned to the local DLOC or mailed to: U.S. Small Business Administration, Processing and Disbursement Center, 14925 Kingsport Road, Fort Worth, TX 76155. The filing deadline to return applications for physical property damage is Dec. 24, 2018. The deadline to return economic injury disaster loan applications is July 23, 2019. Now that the flood waters have receded and the recovery process begins, it is very important to look to what your future may hold within the next couple of days. In order to get the proper assistance after a disaster like this has occurred, it is important to document your losses in a detailed manner.